In an effort to highlight places of interest in countries across the world, their varied culture, economy and history, The Statesman brings to you a Weekly Focus on countries with which India shares diplomatic ties and friendship. This week’s focus is on Bahrain. Know all about the country. As a Muslim country, Bahrain holidays are usually devoted to Islam and part of a formal schedule that changes from year to year, depending on the lunar calendar. The biggest annual events go by the name Eid ~ meaning “celebration” in Arabic ~ which tend to mark the end of most solemn religious periods of the year. Other festivals celebrated are Muharram (Islamic New Year), Ashura, Milad Al Nabi (birth of the Prophet Mohammed), Independence Day, Ramadan and Eid Al Fitr. Apart from the Arab cuisine, this beautiful country also specialises in Asian cuisines from India, Philippines, Pakistan and Thailand. Bahraini cuisine is primarily a blend of strong and spicy flavours. Lamb is their dominant meat, followed by chicken, duck, and turkey. If the ubiquitous Gulf menu of rice, lamb and mezze (hummus, chopped salads and other appetisers) is not to your taste, then try the locally caught prawns and lobster. The fruit juices, such as lemon and mint, are irresistible in summer. June to October, hot and humid (32°C/89°F), December to April, mild (15-25°C/59- 77°F). December through to March can be quite cool. Rainfall is slight and occurs mainly in winter. 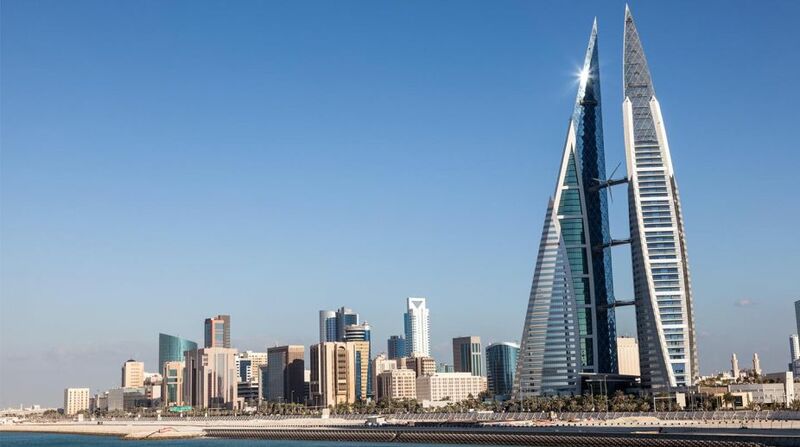 The best time to visit Bahrain is February to April and October to December, when the sky is free from heat haze and the weather sunny without being oppressive. Alcohol is widely available for non-Muslim adults over the age of 18 in mosttop-end restaurants and hotel bars in Manama. Drinking alcohol in public outside these establishments is prohibited. National specialities are Machbous, Muchammar, Baba ghanoush, Shawarma and Sambousa. Its regional drinks are Arak (grape spirit flavoured with aniseed) and Gahwa. There is no direct flight connectivity between Bahrain and India. Top international airlines like Air India, Kuwait Airways, Lufthansa, Oman Air, Air Arabia, Emirates, British Airways, Vistara, Etihad Airways, Qatar Airways, Jet Airways, Thai Airways and Malaysia Airlines ply close to 665 connecting flights from Bangalore to Bahrain every week. While there were only 90,000 Indian nationals working in Bahrain in the year 2000, the number has since increased to 350,000 (approximately). Out of this total, as many as 220,000 are from Kerala. Andhra Pradesh and Tamil Nadu account for roughly 40,000 people each. Over 50,000 come from Maharashtra, Karnataka and Punjab. In terms of professions, the vast majority (70%) of the nationals are in the category of unskilled labour. Banking, medicine, and management account for the bulk of the well to do. The Indian expatriate community enjoys great goodwill from the Bahraini authorities and employers alike. (August 2014). India and Bahrain have had economic and trade relations for over several centuries; these relations received fresh impetus from the oil boom of the early seventies. Relative prosperity and higher standard of living in Bahrain boosted global imports of goods and services, including from India. Bahrain government’s policy of industrial diversification also played an important role in enhancing economic cooperation between India and Bahrain. Bahrain serves as the gateway to the GCC market because of its location. India imports mainly crude oil, ores, slag/ash, petroleum products, Aluminum and fertilizers. It exports inorganic chemicals, organic and inorganic compounds of precious metals, ships and boats, boilers and machineries, Iron and steel, and processed food. Al Fateh Grand Mosque, Manama: Al Fateh is the mosque in Bahrain that is capable of reconciling an audience of 7,000 and is one of the largest mosques. This mosque was built in 1988. It was built with marble, glass and teak wood. The most attractive feature is the dome, which is made of fibreglass and gives a fascinating view at night. It is the currently the largest fibreglass dome in the world. Bahrain National Museum, Manama: One of the most alluring buildings in Bahrain, it opened in 1988 with a sensational patio overlooking the sea front. This is the first museum in Bahrain, covering 6,000-year history. It is one of the most melodramatic places to visit in Bahrain. The museum has a large collection of archaeological material. Halls, galleries, shops and a cafeteria are also located here. Jebel Al Dukhan: Also called mountain of smoke, Jebel Al Dukhan is the highest elevated hill in Bahrain. This mountain is a high point of the country at 143 m in height. Many caves of imprecise types are located in the environs of the mountain. The southern part of the mountain is the best place for overnight camping. Al Areen Wildlife Park, Sakhir: A mere 40 minutes away from Manama Center is Al Areen Wildlife Park, one of the best spots for tourist activity in Bahrain. This lush green park has a huge number of flora and fauna, including more than 500 species of animals and 10,000 plants. It has two parts, one of which is open for people and the other one is the reserve area. Qal’at Al-Bahrain: On the Arabian peninsula, an archaeological site rising to a height of 39 ft is found. It is 6 km away from Manama city and a huge amount of antiques are found here. The Capital of Dilmun, it is a fort of seven-stratified layers, which is spread over 10,000 sq ft. It has a mounded structure and at about 12m high is a fort, which gives its name to this historic area. The structure shows the presence of a small settlement in the past, with small houses built of rough stone with clay or mortar as binding material. This whole area is beautiful to look. Other tourist attractions are Arad Fort, Bab-Al-Bahrain, the Isa Bin Ali Al Khalifa House in Al Muharraq, the World Trade Center of Bahrain, the Heritage Centre, Beit Al-Quran, the Oil Museum, 500-year-old Tree of Life and Bahrain International Circuit.